Made from crushed, screened, and magnetically cleaned Bullseye Compatible sheet glass. • Torchworking and blowing, to create colors and patterns on surfaces. To learn about the performance characteristics of specific glasses, visit About Our Glass. 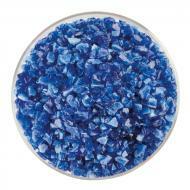 The color of the frit in its unfired and fired states may differ greatly. Please refer to the second 'More Views' image to get a sense of the approximate fired color. In application, color saturation may vary. Thin layers may be lighter in color. Thicker layers may be darker and more saturated in color.